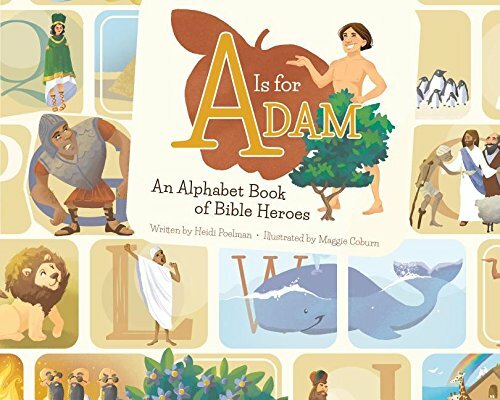 Heidi Poelman is the author of A is for Abinadi: An Alphabet Book of ScriptureHeroes, A Mother's Greatest Gift, The Two-Minute Marriage Project: Simple Secrets for Staying in Love, and the upcoming books I Can Love Like Jesus and A Is forAdam: An Alphabet Book of Scripture Heroes. Heidi received her degrees in communication from Brigham Young University (BA) and Wake ForestUniversity (MA). She lives in Utah with her husband and three children. Maggie Coburn loves drawing and storytelling. She has her BA in anthropology from UC Santa Cruz (where she discovered the amazing art form that is scientific illustration), and her MFA in traditional illustration from the Academy of Art University in San Francisco. She lives with her husband and son in California. I have a special place in my heart for children's books, and the colors and how bright and happy everything is in A is for Adam makes me very happy indeed. A couple things I really liked about this book is first, the words. I thought the author did a great job of paraphrasing each person or quality. I also liked how there were qualities, like obedience, in there. Good lessons for my children. Very well written. I was pleased to see a page of review for letters A-L and what they stood for, and at the end a page of M-Z and what they stood for. I'm thinking of all kinds of activities I could do for that. I like how the inside page right when you open and close the book are colorful and have the alphabet on them instead of just a blank white page. My 6 year old daughter didn't really love the silly illustrations, like on the Good Samaritan he got hit in the head with a golf ball while on the golf course. She just didn't understand why the funny things were in the pictures, and she struggled with that. While I love the colors and the pictures are well done, I do agree with her that some of them were just too silly. My 4 year old didn't have a problem with it though. Her favorite picture was Shadrac and him singing with sunglasses in the fire with his buddies. Source: We will be receiving copies from the publisher in exchange for an honest review.